On Sunday 17 June 2018, we presented pop-up classical performances by young artists-in-training from Wesley Music Centre's music scholars program, and from the voice & piano studio of WVMT. This project was a partnership between Wesley Music Centre and WVMT, designed to showcase the musicality and celebrate the work ethic of local teenaged and tertiary level students training in concert music performance and/or preparing for professional careers as classical musicians. 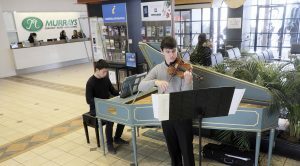 The 2018 focus was on JS Bach and included a harpsichordist, pianists, singers, a choir and strings. With support from the ACT Government under the City Renewal Authority’s City Grants program. We hope this is the beginning of an annual event, each year focussing on a different composer. Perhaps a focus on the Schumann's next? More info in 2019.